Growing and caring for mushrooms can be a time-consuming task, but very rewarding. The lion's mane mushroom, also known as hericium americanum, is an edible mushroom that is commonly sought after by chefs because of its strong flavor resemblance to lobster meat. Easily identified by their snowy-white pom-pom like growth, these mushrooms can be found hanging from logs and rock faces in very damp locations. By following these simple steps, you can grow lion's mane mushrooms in your backyard with a few simple materials. Cut a log using your chain saw, which measures between 12 and 16 inches in diameter. You can cut more than one log, depending on the amount of mushrooms that you intend to grow. Drill holes into your log(s) using your power drill and 5/16-inch drill bit. The holes should be drilled 2 and 4 inches in depth and 3 to 5 inches apart. Drill the holes in an oval or diamond shaped pattern. Repeat this process as many times as possible on the upward face and sides of the log(s), but not on the bottom. Place the mushroom spawn plug(s) into each drilled hole by use of the rubber mallet. Do not use a regular heavyweight hammer. The metal hammer could damage the mushroom spawn plugs. You can purchase these mushroom spawn plugs from a garden specialty store or an online mushroom supplier. Heat the beeswax until it has melted into a liquid state. Brush the melted beeswax over each inserted mushroom spawn plug using your foam craft brush. The beeswax coating will protect the mushroom spawn plug(s) from weather, insects parasites. Place the logs you have prepared with the wax coating and mushroom spawn plugs in a damp, shady area. 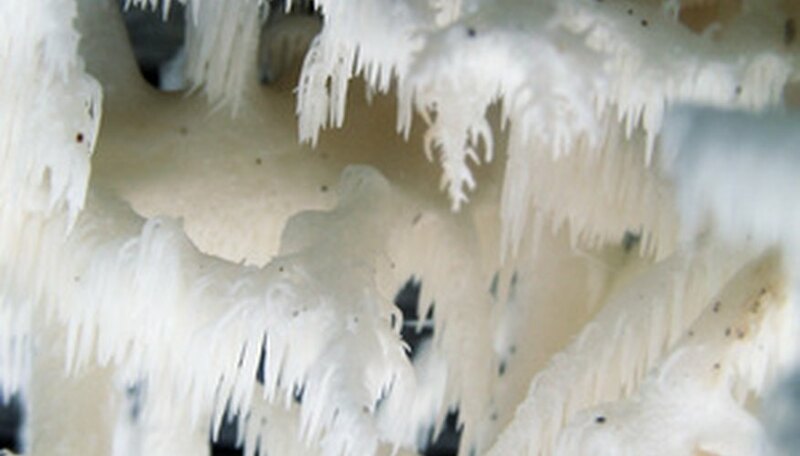 These conditions will allow the mushrooms to sprout and grow in their natural environment. If your place of residence does not receive rain on a regular basis, you can soak the log(s) in water each week, or simply spray them with a garden hose. Damp, wet conditions are key in growing mushrooms. Label the logs with weather-proof garden tags to keep track of the date the mushrooms were started. The growing process will take approximately one year.